Veganism is a way of living which seeks to exclude, as far as possible and practicable, all forms of exploitation of, and cruelty to, animals for food, clothing or any other purpose. 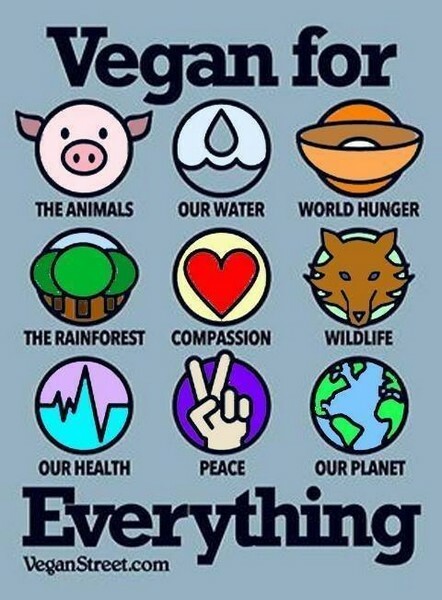 Therefore, vegans do not consume any animal products (meat, fish, dairy, eggs and honey) and do not wear or use clothes, shoes or furnishings made with the skins, hair or feathers of other animals, including fur, leather, wool, feathers and silk. More and more people are going vegan for health reasons. Indeed, well-planned whole-foods, plant-based diets are rich in protein, calcium, iron, fiber and other essential vitamins and minerals. The benefits of eating a whole-food, plant-based diet include better skin and digestion and increased energy. Furthermore, it has been scientifically proven that a plant-based diet can lower blood pressure, reduce risk of heart disease and stoke and prevent some types of cancer. Most, if not all, of the degenerative diseases that afflict us can be controlled, or even reversed, by rejecting animal-based and processed foods. Watch the trailer of Forks Over Knives or buy the movie here to learn more about how the standard American diet – and any diet rich in meat, dairy and processed foods – causes obesity, diabetes, heart disease and cancer. When you think about it, you realise that eating animals is a cultural thing. We, in our society, have been accustomed to love and view dogs and cats as our pets and to see pigs, cows and chickens as objects to be turned into food. But there are other cultures where people eat cats and dogs. You may be thinking that it is wrong to eat dogs, and it certainly is, but why would it be wrong to eat dogs and right to eat pigs? Most importantly, why would it be wrong to kill dogs and right to kill pigs? This is called speciesism. Watch this amazing video to learn more about the topic. Animals are not food products, but thinking, feeling individuals who want to enjoy their lives as much as we do. An animal’s life is as important and irreplaceable to them, as ours is to us. We need to stop thinking of them as just resources and to start viewing them for who they are – individual sentient beings whose lives deserve to be respected and valued. We are currently growing enough food to feed 10 billion people, yet 800 million people do not have enough food because we continue to waste valuable agricultural land by obtaining only a small fraction of its potential calorific value. Studies have shown that a varied vegan diet required about a third of the land needed for conventional Western diets; 3.5 billion humans could live off the food currently fed to livestock. The good news is there IS something we can do about it. Every time we shop or order food in a restaurant – every time we eat – we can choose to help these animals. Every time we make the switch from an animal product to a vegan one we are standing up for farmed animals everywhere. Going vegan is easier than ever before with veganism becoming increasingly mainstream as more and more people from all walks of life discover the benefits of eating this way. If you would like to go vegan, you can read my 14 Tips For Going Vegan. It’s time to ask ourselves: if it is now possible to live a life that involves delicious food and drink, delivers better health, leaves a smaller carbon footprint and avoids killing other creatures – then why don’t we?